Black and white photograph of the Northern Navigation Company steamboats HAMONIC AND NORONIC at the pier in Port Arthur, ON. 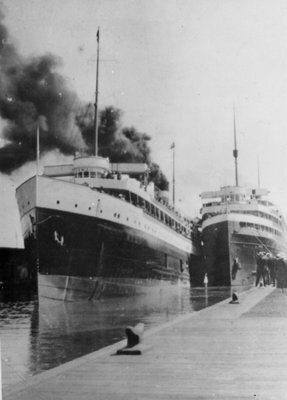 Just under HAMONIC is crowded with passengers and belches clouds of smoke. Reverse: "J. [W. Bald] Midland"